Loss prevention continues to be a top-of-mind issues for retail managers, as losses due to shoplifting and employee theft continue to cause major headaches. According to a 2014 Global Retail Theft Barometer study, “Shrink cost the global retail industry more than $128 billion last year, with $42 billion lost in the United States alone” (Source). Although retail theft can be a huge issues for stores, there is light at the end of the tunnel: there are a variety of theft-reduction solutions out there for businesses of all sizes. To help retailers become more vigilant about loss prevention, we’ve compiled a list of tools and services for reducing shrink and improving your retail store’s security. 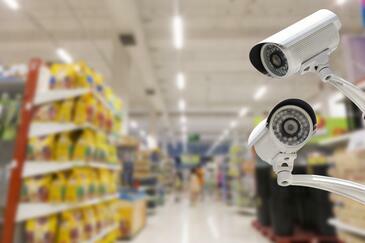 Security camera systems are an effective middle-of-the-road option for reducing retail theft both short and long term. Not only do security cameras allow you to monitor your customers and employees, they also provide a distinct visual deterrent to potential shoplifters. Although detailed top-of-the-line camera systems can be a sizable investment, a basic system doesn’t have to be. In fact, like most forms of technology these days, security camera systems have seen their quality drastically improve while their prices have dropped. For all the information you need to pick the right system for your small retail business, see our guide to the best security cameras. If you’re looking for a low-cost method to deter shoplifters and other shady individuals, installing security signs in your store is a good start. Take a few minutes to walk around your store and ask yourself: where would you go if you we’re a shoplifter? The answer to this question should help you to figure out the best places to install your signs. Of course, if you have a large store, it may be in your best interest to consult with a security firm so they can assess your store and determine security weak-points. Place a sign at or near the front door, as it’s one of the first places shoppers look. There’s a fair chance that you’ve heard about the advantages of in-store analytics when it relates to sales and marketing (determining traffic flow), but did you know that you can also use analytics to boost your store security? For example, video surveillance tools will allow you to see where people tend to linger for long periods of time. Using foot traffic information combined with inventory and POS data can help you to detect discrepancies or unusual inventory patterns before they evolve into a larger issue. Doubling your efforts to combat retail theft lets your employees know that you’re paying the utmost attention, and this awareness alone fosters a deterrent to employee theft. Take time to run training and loss-prevention programs to educate your team on how you will punish theft as well as how they can identify theft when it occurs in real-time. When you take the time and effort necessary to train your staff members about recognizing shoplifters, you enlist their help in preventing customer theft. There are many instances when hiring a full-time security officer is a great retail-theft prevention choice. While it’s helpful to educate your employees on how to spot shoplifters, when the store is busy employees can become easily distracted. It’s in these situations that a dedicated security officer can offer tremendous value, keeping an eye on all incoming/outgoing traffic. Both uniformed and plain-clothes guards have the potential to help you to improve your retail store’s security. Plain-clothes guards are more effective in thwarting thieves, as they look much like a regular customer; however, they are not nearly as effective of an overall deterrent as uniformed guards. On the other hand, while uniformed guards offer a visual deterrent, they can potentially make loyal customers uncomfortable. Pleading ignorance is no excuse when it comes to retail shrinkage. You can count on this: if you aren’t paying attention and actively trying to mitigate shrinkage losses, it will occur. That’s why it’s so crucial to know what to protect against as well as what tools are most effective. With that in mind, use the tips discussed in this blog to reduce retail loss at your location. At United Security Inc., we understand that every client's risk and objectives require nuanced approaches, policies, and procedures. Our management and field personnel work with you to develop a detailed plan to protect your store, whether it's by staffing your store with security officers or installing video surveillance systems. Considering security officers for your business? Click below to schedule a no-cost property evaluation to see how security officers can meet your specific needs.